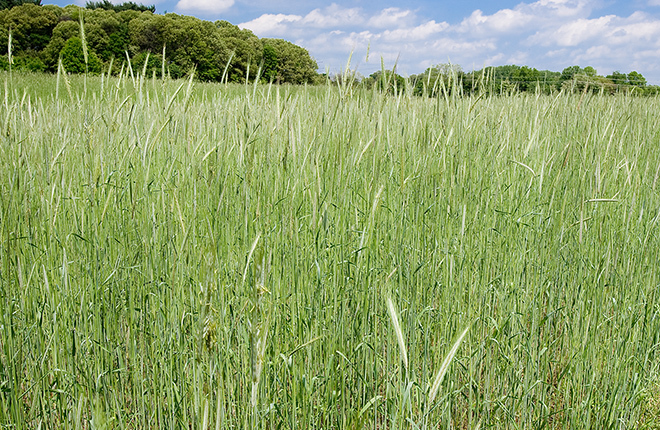 A cereal rye cover crop, one of many crops featured in the online Cover Crop Chart developed by ARS. (Stephen Ausmus, D1507-11). A cover crop mixture that includes oat, proso millet, canola, sunflower, dry pea, soybean, and pasja turnip. (Mark Liebig, D3434-1). An online tool called the “Cover Crop Chart” is helping U.S. farmers decide which cover crops to plant and is generating interest from growers in other countries. 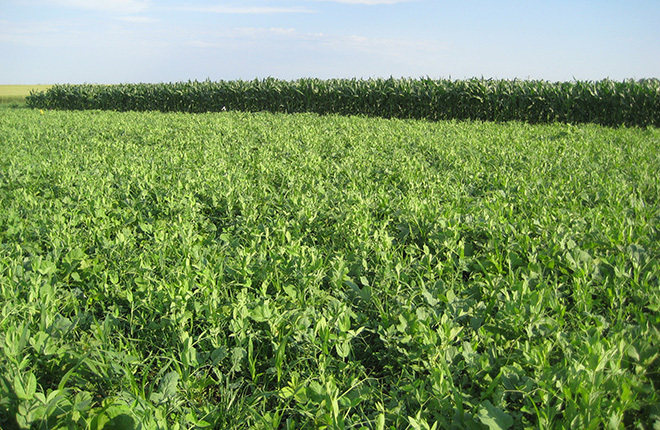 Cover crops can help reduce soil erosion, increase organic matter, improve early weed control, and provide forage for animals. They can also benefit the public by improving water quality, air quality, and wildlife habitat. Drought conditions in recent years have renewed many growers’ and ranchers’ interest in cover crops—which are typically grown during the off-season—to help mitigate effects of extreme weather conditions. This interest has increased the need for information on suitable crops to help growers meet their individual production and management goals. To help address these needs, researchers at the Agricultural Research Service’s Northern Great Plains Research Laboratory (NGPRL) in Mandan, North Dakota, developed the Cover Crop Chart. It is available on the NGPRL home page and can be downloaded for free. “Although a lot of information is available on cover crops, it is often organized by individual crops. Unfortunately, this way of looking at cover crops falls short in showing how they could potentially complement each other in mixtures,” says NGPRL soil scientist Mark Liebig. Patterned after the periodic table of elements, the interactive chart includes information on crop species that may be planted individually or in mixtures and gives specifics on growth cycle, relative water use, plant architecture, forage quality, pollination, and more. “In developing the chart, we realized that just as chemicals are grouped by the same electron configurations, crops could be categorized by similar attributes—cool season or warm season, grasses or broadleaf, and legumes,” Liebig says. The chart allows growers to see the broad spectrum of potential options that may work best for them, he adds. It also includes relevant research at NGPRL, particularly on forage quality, water use, and sequencing of individual crops. “We’re basically repackaging information into a useful visual aid—a first step for customers to learn about cover crops,” Liebig says. In addition to U.S. customers, growers from 37 other countries have already used the chart since its initial release in 2010. Feedback from users highlighted the educational value of the chart and provided suggestions that are included in a 2015 update. The chart now includes 12 more crops for a total of 58 species, provides information on saline-tolerant grasses, and addresses the placement of crop species within a cash-crop rotation. “Customers also suggested a downloadable application for mobile devices,” Liebig says. “We hope to be able to provide this type of access to the chart in the future.”—By Sandra Avant, Agricultural Research Service Information Staff. “Chart Makes It Easier To Select Cover Crops” was published in the June 2015 issue of AgResearch Magazine. Free online tool called “Cover Crop Chart”. Helps farmers decide which cover crops to plant. Provides information on 58 cover crop species. Highlights benefits of each crop.